Ed Carpenter Racing and Scuderia Corsa are joining forces to field driver Ed Jones in the 2019 IndyCar Series season, the teams announced Wednesday. Jones will drive the No. 20 Ed Carpenter Racing Scuderia Corsa Chevrolet at all 12 road- and street-course races on the schedule, with team co-owner Ed Carpenter continuing to drive the car in the five oval events. In addition, the team will field a third entry, the No. 64 Chevrolet, for Jones to drive in the 103rd Indianapolis 500 on May 26. ECR began competing in the Verizon IndyCar Series in 2012 and has run a two-car effort since 2015, picking up a total of seven race wins. Scuderia Corsa, a winning sports car racing team since 2013, made its Verizon IndyCar Series debut at this year’s Indianapolis 500 in impressive fashion. Fielding the No. 64 entry in an alignment with Rahal Letterman Lanigan Racing, driver Oriol Servia was running in second place before being forced to pit for a splash of fuel with four laps to go and finishing 17th. Jones, 23, will be competing in his third IndyCar Series season in 2019. He was named Sunoco Rookie of the Year in 2017, when he finished 14th in the point standings with five top-10 finishes for Dale Coyne Racing, including a third-place effort at the Indianapolis 500. He moved to Chip Ganassi Racing in 2018, where he scored eight top-10s and two podiums on his way to 13th place in the championship. “I am very excited to welcome Ed Jones to the ECR family, as well as Scuderia Corsa and Giacomo,” Carpenter said. “I was very surprised when Ed became available at the end of the season. I look forward to working together to get ECR back in Victory Lane." With Spencer Pigot returning to drive the No. 21 Ed Carpenter Racing Chevrolet at all IndyCar Series races in 2019, it gives the team two of the most recent Indy Lights presented by Cooper Tires champions. Pigot, 25, won the 2015 title in the top Mazda Road to Indy development ladder level, with Jones taking the crown the following year. 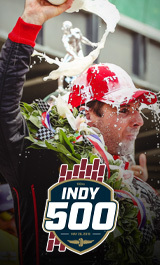 The 2019 IndyCar Series season features 17 races, opening with the Firestone Grand Prix of St. Petersburg on March 10 and concluding with the INDYCAR Grand Prix of Monterey on Sept. 22. All races will air live on NBC or NBCSN, as well as the Advance Auto Parts INDYCAR Radio Network.